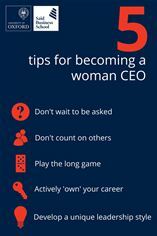 Don’t wait to be asked, don’t count on others, play the long game, actively ‘own’ your career and develop a unique leadership style: these are the principal recommendations to aspiring women leaders that come out of a study of female CEOs by academics from Saïd Business School, University of Oxford. ‘Claiming the corner office: Female CEO careers and implications for leadership development’, by Andromachi Athanasopoulou, Amanda Moss-Cowan, Michael Smets, and Timothy Morris, is published in Human Resource Management. It draws on in-depth qualitative interviews with 12 female CEOs and 139 male CEOs of global corporations, aimed at exploring what enables some women to become CEOs. The female CEOs in the study described the way they recognised their leadership ambition and potential as a moment of ‘acceptance’ rather than celebration. ‘All leaders face difficult work–life trade-offs, but women are often still judged for prioritising career over family. For a woman to recognise her leadership ambition requires making a conscious and effortful choice about what she will become, what she will give up, and the criticisms she will face,’ said Amanda Moss-Cowan, Research Associate at Oxford Saïd and Assistant Professor of Management at the University of Rhode Island College of Business Administration. ‘While our CEOs took work–life balance issues seriously, they framed work–life decisions like other business decisions: recognise the need to make trade-offs, make a choice, accept the responsibilities that come with it, and move on.